Posted by IndianaHCI on September 13, 2017, in Crawford County. 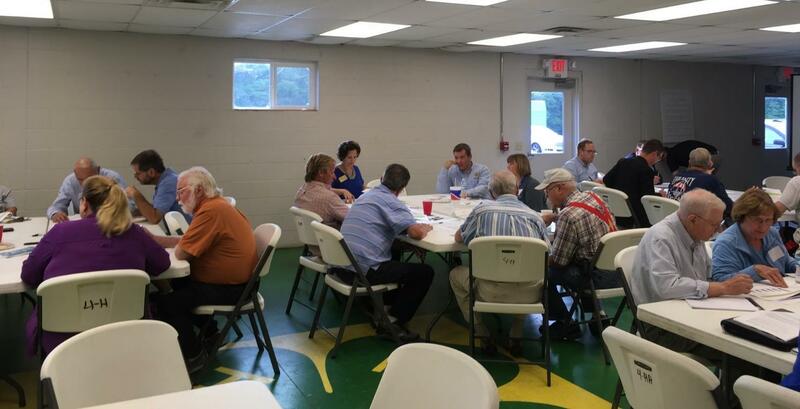 Crawford County hosted their Hometown Collaboration Initiative (HCI) community forum on August 30, 2017 to seek thoughts and insights about how to make their community an even greater place to live. “Before our HCI team decides on what Building Block to embrace, we want to hear from you,” facilitating HCI team member Morgan Stutzman explained. Participants were divided into groups to discuss the Building Blocks of Placemaking, Economy and Leadership. Through the forum, the HCI team was able to collect suggestions for improving these important Building Blocks of the community. For Placemaking, suggestions included expanding the perception of the county as a tourist destination through providing more overnight accommodations and creating a brand for the county. The Economy Building Block focused on growing small businesses through mentorships, networks and promoting the “small town” feel the businesses provide. Finally, Leadership had ideas for both current and future leaders, from trainings for the next generation to encouraging current leaders to take part in events, such as the forum. The Crawford County HCI team will carefully look at the information collected from both the community forum and a survey that was distributed during the summer before selecting a Building Block that will help their community grow in either Leadership, Placemaking or Economy. The forum report can be found here.